Los Angeles, which is widely known as the “City of Angels” is the second city in the US (after New York) by the number of inhabitants. With more than 4 million of inhabitants, Los Angeles is a city of global scale. The profitable economy is based on manufacturing, international trade, tourism and entertainment. Moreover, an important role belongs to the financial sector of the jurisprudence, economy, transport and medicine. Obviously, Hollywood has brought a worldwide fame to the city. In addition to this global filmmaking center, Los Angeles has other media businesses. The most important of them are the television products, sound recording and computer games. All this reasonably allows us to call Los Angeles “the world’s entertainment center.” The main attractions and landmarks of the city are City Hall, Chinatown, Koreatown, Olvera Street, Venice, Walt Disney Concert Hall, Kodak Theater, Griffith Observatory, Getty Center, Memorial Coliseum Stadium, Staples Center, the Los Angeles County Museum of Art (or LACMA), the Hollywood Boulevard, the Hollywood Sign and the other. If you do not have enough time to visit them all, the car rental in Los Angeles Airport will be a reasonable choice for you! The cherished dream of many students is precisely the University of California in Los Angeles. It is a prestigious university, and at the same time, it is quite feasible to enter it. Take exams and collect documents – we will tell you how to become a student of UCLA! 13 Nobel laureates, 12 titles of the National Collegiate Athletic Association (NCAA), 250 Olympic medals and 12th place in the ranking of the best universities in the world, according to Times Higher Education – all this is about the University of California in Los Angeles. Its campus covers an area of ​​about 170 hectares, housing five colleges, seven vocational schools and four medical schools of science. There everything needed for the student could be found: an old library with impressive architecture, hospitals, where future doctors are practicing, a cinema, a swimming pool, a gym, a basketball arena, dozens of canteens and cafes. In addition, in eight kilometers from the campus, is the Pacific Ocean! The faculties here are called ‘schools’ and ‘colleges’: the College of Literature and Sciences, the School of Arts and Architecture, the College of Engineering and Applied Sciences, the School of Nursing/Theater/Film and Television. In total, there are about 300 specialties in the university. The most impressive faculty is the College of Literature and Sciences. They study biology, chemistry and biochemistry, mathematics, physics, biophysics and astrophysics, economics, geography and geology, political science, psychology and sociology, linguistics, various languages, etc. A promising area is the School of Engineering and Applied Sciences, where they study bioengineering, engineering, electrical engineering and computer science. Among other specialties, it is worth noting cinema, television and theater: after all, Los Angeles is the world capital of the film industry! Among more than 150 well-known graduates, there are scientists, actors, psychologists and outstanding personalities in the business sphere. Tim Robbins, Francis Ford Coppola, Jack Black, Ben Stiller and others have studied there. 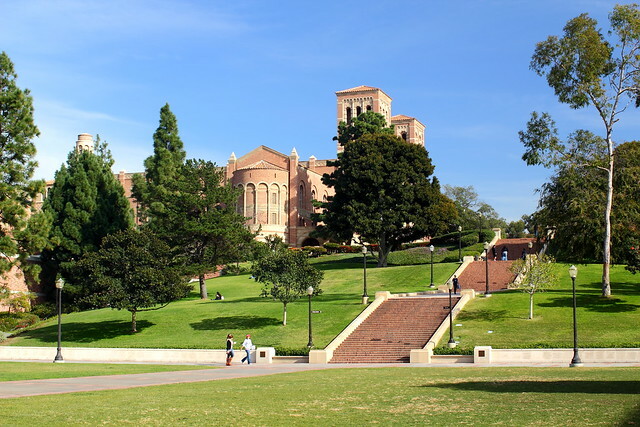 In addition, there are several notable objects on the territory of UCLA. 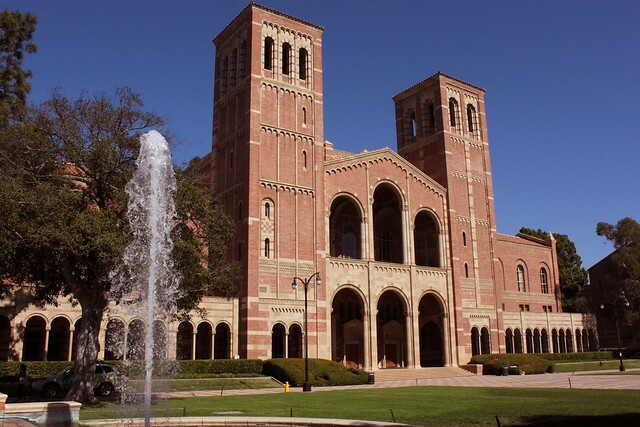 Royce Hall is the most recognizable building of the university. It hosts meetings and jazz evenings, various performances and concerts. Here you can find the Japanese garden of Hannah Carter, the old cinema, the inverted fountain and the square of sculptures. The university boasts of a special center for gifted children, of numerous research centers and its own forensic laboratory. The cost of studying for a year (including accommodation in a hostel, food, books, training materials, medical insurance, transportation and personal expenses) is: for residents of California – about $ 34 thousand; for non-residents – about $ 59 thousand. It is possible to rent an apartment outside the campus or live with relatives. In this case, the cost of the study will be $ 25-30 thousand for residents of the state, and $ 50 -55 thousand for non-residents. The cost of studying in a magistracy (without accommodation and meals) for the year is: for residents of California – about $ 16 thousand; for non-residents – about $ 31 thousand. Last year, more than 86,000 students applied for admission to the University of California Los Angeles. In order to apply as well, fill out an application on the website. The admission fee is about $ 100. You need to attach two small essays with a story about yourself, the country where you come from, your ambitions, hopes, achievements, etc. The University of California in Los Angeles has an Extension faculty, which provides additional educational programs. Classes are aimed at both students and working people, so they take place either in the evening or on weekends. Among the offered subjects are: American English, design and architecture, art and photography, business and finance, programming and technology, music and entertainment industry, management, law, science and mathematics, etc. Within each specialty, students are offered courses for more specific study. The period of the study depends on the chosen course, after which students receive a certificate. In addition, the University annually offers various summer programs for students and schoolchildren – both from the US and from other countries. Online courses are available. Students can also receive a scholarship and a study grant. However, the university assistance is provided only to those, who have US citizenship, or are permanent residents of the country. The rest are advised to consider other available sponsorship and credit programs.